Despite recent gains in knowledge regarding CD1d-restricted NKT cells, very little is understood of non-CD1d-restricted NKT cells such as CD8+NK1.1+ T cells, in part because of the very small proportion of these cells in the periphery. In this study we took advantage of the high number of CD8+NK1.1+ T cells in IL-15-transgenic mice to characterize this T cell population. In the IL-15-transgenic mice, the absolute number of CD1d-tetramer+ NKT cells did not increase, although IL-15 has been shown to play a critical role in the development and expansion of these cells. The CD8+NK1.1+ T cells in the IL-15-transgenic mice did not react with CD1d-tetramer. Approximately 50% of CD8+NK1.1+ T cells were CD8αα. In contrast to CD4+NK1.1+ T cells, which were mostly CD1d-restricted NKT cells and of which ∼70% were CD69+CD44+, ∼70% of CD8+NK1.1+ T cells were CD69−CD44+. We could also expand similar CD8ααNK1.1+ T cells but not CD4+ NKT cells from CD8α+β− bone marrow cells cultured ex vivo with IL-15. These results indicate that the increased CD8ααNK1.1+ T cells are not activated conventional CD8+ T cells and do not arise from conventional CD8αβ precursors. CD8ααNK1.1+ T cells produced very large amounts of IFN-γ and degranulated upon TCR activation. 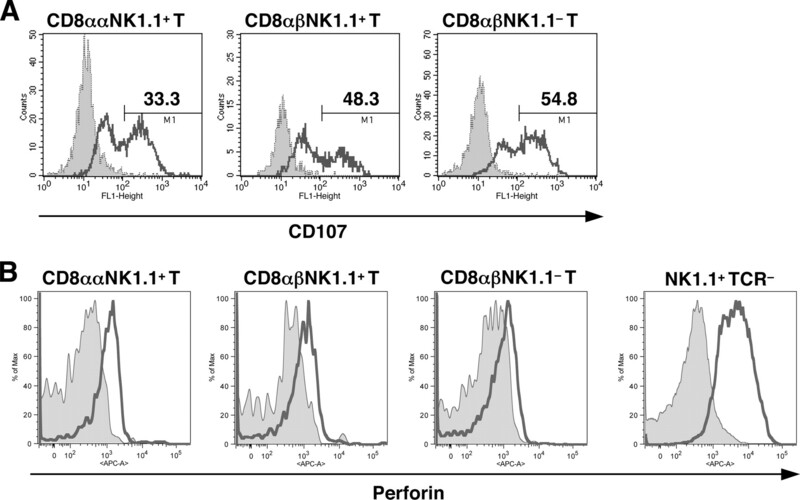 These results suggest that high levels of IL-15 induce expansion or differentiation of a novel NK1.1+ T cell subset, CD8ααNK1.1+ T cells, and that IL-15-transgenic mice may be a useful resource for studying the functional relevance of CD8+NK1.1+ T cells. Cytokines are critical for lymphocyte development and maintenance. For T cells, γc cytokines have been shown to play critical roles in their development and maintenance, but lymphocyte development, maintenance, and expansion are each supported by different cytokines. Also, different lymphocyte subsets are dependent on different cytokines. Among these, IL-15 is a pleiotropic cytokine that has been shown to play an important role in supporting the development and maintenance of distinct subsets of lymphocytes of both innate and adaptive immunity (1). We asked whether, when present in supraphysiologic levels, IL-15 would selectively expand or maintain certain T cell populations and whether any unusual T cell subsets might be revealed by a resulting greater abundance of normally rare cells. IL-15 has been shown to be essential for the development of NK cells and important for their survival and activation (2). IL-15 is also essential for the homeostasis of memory CD8+ T cells (3) and plays a critical role in the induction of memory CD8+ T cells with high functional avidity (4). The absence of IL-15 disrupts the development of NK cells and prevents the maintenance of CD8+ T cells with memory phenotype (5). It also significantly reduces the number of NKT cells with invariant TCR α-chain Vα14Jα18 segment (iNKT cells)3 in the thymus and the periphery, although this cytokine may not be essential for their development (5, 6, 7). However, IL-15 seems to be essential for the maintenance and homeostasis of iNKT cells in the periphery. The study of Ranson et al. also suggested that the availability of IL-15 may determine the population size of iNKT cells as an explanation for their finding of a higher proliferation of iNKT cells in an NK-deficient host (lacking NK cells to consume IL-15) (7). However, the effect of excess IL-15 in the development and maintenance of iNKT cells has not been studied. Previously it has been shown that mice expressing high levels of IL-15 have a high frequency of NK1.1+ T cells (8, 9). Among those NK1.1+ T cells, a significant fraction of the cells was CD8+ compared with the cells in wild-type counterpart animals. However, whether those were iNKT cells or other types of T cells up-regulating NK1.1 as an activation marker was not determined. In this study, we further characterized the unusual CD8+NK1.1+ T cells from IL-15 transgenic (Tg) mice. The number of iNKT cells in IL-15 Tg mice did not differ from that in wild-type littermate mice despite the fact that the IL-15 Tg mice have a significant level of free IL-15 in the peripheral blood (650–800 pg/ml free cytokine). Also, the iNKT cells remained CD8-negative. Approximately half of the CD8+NK1.1+ T cells did not express CD8β. Those CD8ααNK1.1+ T cells were also detectable in wild-type mice, although they were a very small population in the wild-type mice. CD8ααNK1.1+ T cells could be expanded ex vivo from CD8β− but not CD8α− bone marrow cells of wild-type mice by culture in IL-15-containing medium. The CD8ααNK1.1+ T cells produced a high level of IFN-γ upon TCR stimulation and showed lytic activity. These pieces of evidence suggested that IL-15 is not a limiting factor that determines the population size of iNKT cells and that there is another novel NK1.1+ T cell subset (CD8αα) that can be expanded by IL-15. These lines of evidence indicate that this subset does not represent simply activated conventional CD8+ T cells but represents a novel population with a distinct phenotype and TCR repertoire. C57BL/6 mice were purchased from Animal Production Colonies, Frederick Cancer Research Facility, National Institutes of Health (Frederick, MD). I-A gene-deficient, β2-microglobulin gene-deficient, TAP-1 gene-deficient, and OT-1 TCR gene Tg mice were purchased from The Jackson Laboratory. Mice deficient for both Db genes and Kb genes are purchased from Taconic Farms. CD1d gene-deficient mice were generously provided by Dr. A. Bendelac (University of Chicago, Chicago, IL). Human IL-15 gene Tg mice were made as previously reported (8). All mice were bred and maintained under specific pathogen-free conditions. All protocols of experiments were approved by the National Cancer Institute Animal Care and Use Committee (Bethesda, MD). A single cell suspension of bone marrow cells were prepared from femurs of mice. The cells were cultured in complete T cell medium that consisted of RPMI 1640 with 10% FCS, l-glutamine, sodium pyruvate, nonessential amino acids, penicillin, streptomycin, and 5 × 10−5 M 2-ME, with 70 or 35 nM human IL-15 (Peprotech) for 2 wk. In some experiments, the bone marrow cells were depleted of CD8α+ cells or CD8β+ cells before the culture. To deplete CD8α+ cells, the cells were coated with anti-CD8α Ab directly conjugated with magnetic beads (Miltenyi Biotec). For depletion of CD8β+ cells, the cells were coated with PE-labeled anti-CD8β mAb (BD Biosciences) followed by anti-PE magnetic beads (Miltenyi Biotec). The depletion step was conducted with an autoMACS device (Miltenyi Biotec). Small intestine was removed from mice and fragmented into small pieces and stirred for 30 min at 37°C with Ca2+- and Mg2+-free HBSS containing 10% FBS, 15 mM HEPES, 5 mM EDTA, 0.014% w/v DTT, and 100 μg ml−1 gentamicin to isolate epithelial cells and IELs (10). IELs were purified from the cell suspension by a 40/67% gradient of Percoll (Sigma-Aldrich). Single cell suspensions of either spleen cells or bone marrow cells were stained with fluorescein-labeled mAb after blocking CD16/CD32 (BD Biosciences). The Abs used for the staining were specific for mouse CD3, CD4, CD8α, CD8β, Vβ, Vβ2, Vβ3, Vβ4, Vβ5.1 and 5.2, Vβ6, Vβ7, Vβ8.1 and 8.2, Vβ8.3, Vβ9, Vβ10, Vβ11, Vβ12, Vβ13, Vβ14, Vβ17, Vα2, Vα3.2, Vα8, Vα11.11, DX5, Ly49A, Ly49C/I, Ly49D, Ly49G2, 2B4, NKG2A/C/E, NKG2D (all from BD Biosciences), CD2, CD28, CD127, CD103, CD90, NK1.1, and perforin (all from eBioscience). A PE-labeled, SIINFEKL-loaded Kb-pentamer (ProImmune) was used to stain T cells expressing OT-1 TCR. A PE-labeled, α-galactosylceramide (α-GalCer)-loaded CD1d-tetramer (provided by Dr. M. Kronenberg, La Jolla Institute for Allergy and Immunology, La Jolla, CA) was also used to stain iNKT cells. For intracellular perforin staining, after the staining of surface molecules the cells were fixed and permeabilized by using a fixation and permeabilization kit (eBioscience). For CD107 staining, the cells were stimulated with anti-CD28 (10 μg/ml; BD Bioscience) and plate-coated anti-CD3 (10 μg/ml; BD Bioscience) complete T cell medium containing 10 μM monensin (Sigma-Aldrich) for 5 h with FITC-labeled anti-CD107a and anti-CD107b mAbs (BD Biosciences) (11). After washing, the cells were stained for other surface markers before flow cytometry. After staining and washing, the cell fluorescence was measured on a FACSCaliber, FACSAria, or LSR II (BD Biosciences) flow cytometer and analyzed by using CellQuest software (BD Biosciences) or FlowJo (Tree Star). CD8αα and CD8αβ cells were sorted by using magnetic beads from bone marrow cells that were cultured with human IL-15 for 2 wk. The cells were stained with PE-labeled anti-CD8β mAb followed by staining with anti-PE-magnetic beads. The cells were run through an autoMACS device to the separate positive (CD8αβ cells) and negative fractions. The cells in the negative fraction were stained with anti-CD8α magnetic beads and run through an autoMACS to collect the positive fraction (CD8αα cells). The CD8αβ and CD8αα cells were stimulated with anti-CD28 (10 μg/ml) and plate-coated anti-CD3 (10 μg/ml). Culture supernatants were collected after 2 days of stimulation. Concentrations of cytokines in the supernatants were measured by ELISA (R&D Systems) according to the manufacturer’s instructions. Data were analyzed by Mann-Whitney U test, Student’s t test, or Fisher’s method for combining p values by using JMP software (SAS Institute) or SAS for Windows (SAS Institute). It has been reported that IL-15 Tg mice have a high frequency of CD8+NK1.1+ T cells in secondary lymphoid organs (8). 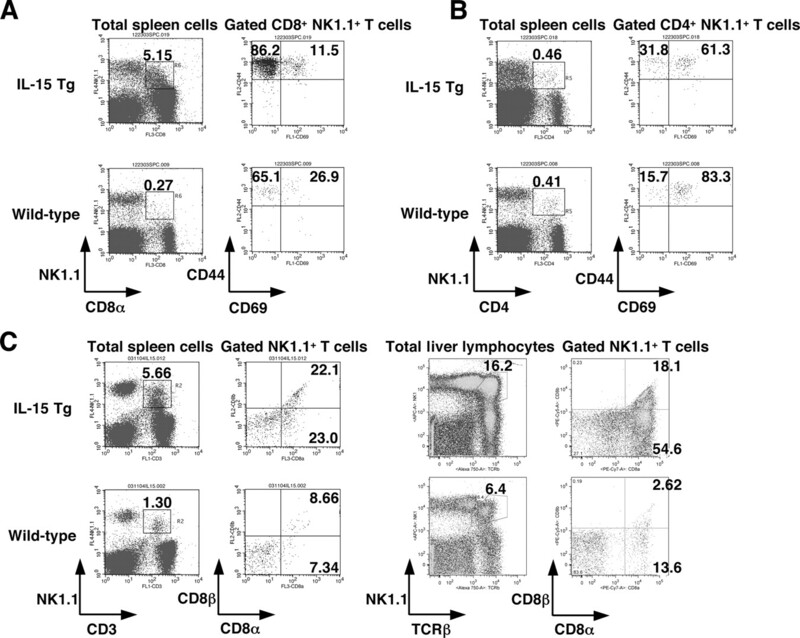 To better characterize those NK1.1+ T cells, the frequency of NK1.1+ T cells and the expression of CD4 and CD8 on spleen cells of IL-15 Tg mice were examined (Fig. 1⇓A). As previously reported, IL-15 Tg mice had a significantly higher frequency of NK1.1+ T cells in the spleen. Also, the absolute number of NK1.1+ T cells was >10-fold higher in the IL-15 Tg mice than in wild-type mice. 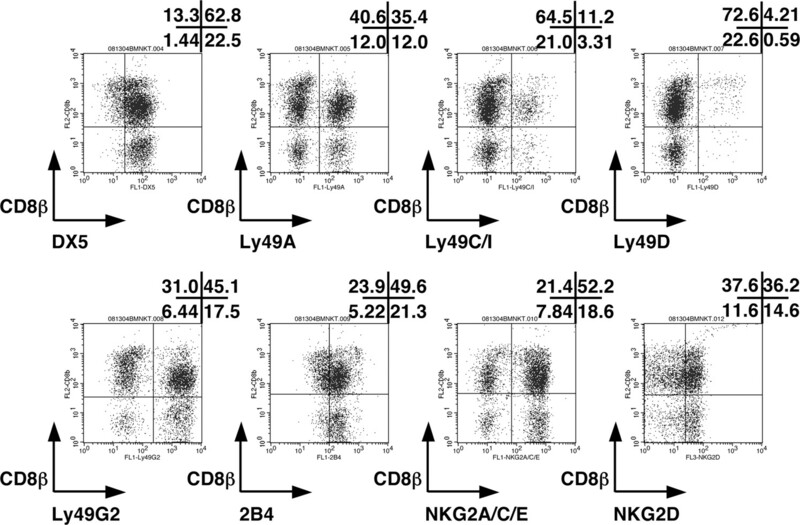 These NK1.1+ T cells were mostly CD8+CD4− in the IL-15 Tg mice, in contrast to these in the wild-type mice in which CD8+CD4− cells were approximately one-third of the NK1.1+T cell population. Because it has been shown that IL-15 plays a critical role in the development of iNKT cells (6), we examined the frequency of iNKT cells in the spleen by using CD1d-tetramer loaded with α-GalCer (Fig. 1⇓B). In contrast to the CD8+NK1.1+ T cells, CD1d-tetramer-reactive iNKT cells did not increase in frequency in the spleens but rather slightly decreased. The absolute number of iNKT cells in the IL-15 Tg mice was very similar to the number in the wild-type mice (CD8+ cells were undetectable). The proportion of CD4+, CD8+, and CD4−CD8− (double negative) cells among CD1d-tetramer-reactive NKT cells was similar to those of the cells from wild-type mice. These data indicated that a high level of IL-15 in vivo increases the abundance of CD8+NK1.1+T cells but not the abundance of classical iNKT cells and that the latter do not up-regulate CD8 in response to IL-15. 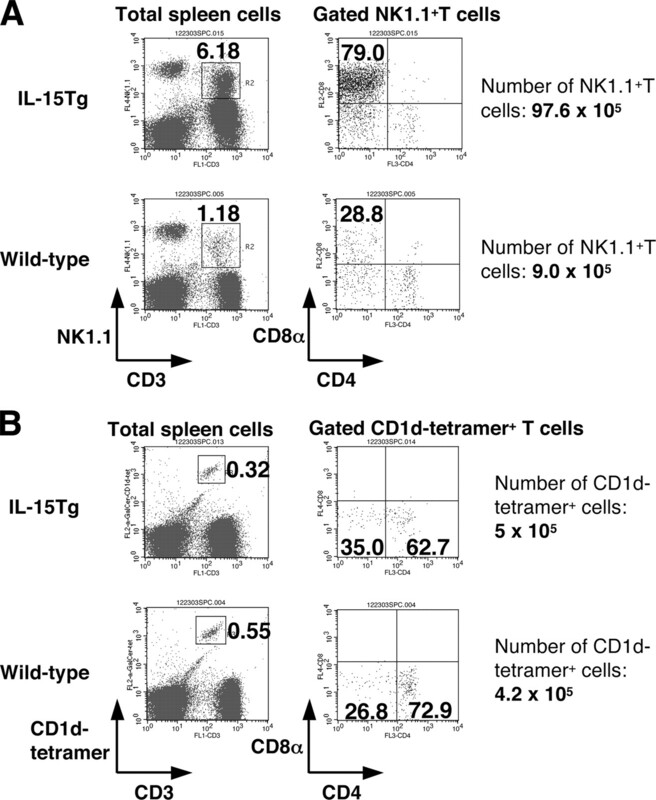 IL-15 Tg mice have a greater number of CD8+NK1.1+ T cells but not α-GalCer-CD1d-tetramer+ T cells. A, Spleen cells of IL-15 Tg mice and wild-type littermate mice were stained with fluorescent-labeled mAbs against CD3, NK1.1, CD4, and CD8α, and the cells were measured by flow cytometry. The dot plots of CD8α vs CD4 in the right column represent the gated CD3+NK1.1+ population shown in the left column. B, Spleen cells of IL-15 Tg mice and wild-type littermate mice were stained with fluorescent-labeled mAbs against CD3, CD4, CD8α, and α-GalCer-loaded CD1d-tetramer, and then the cells were analyzed by flow cytometry. The dot plots of CD8α vs CD4 in the right column represent the gated α-GalCer-loaded CD1d-tetramer+NK1.1+ population shown in the left column. Because IL-15 has been shown to be able to activate CD8+ T cells (1) and because NK1.1 is an activation marker on conventional CD8+ T cells (12, 13), one may possibly explain the mechanism of the accumulation of CD8+NK1.1 T cells via the activation of conventional CD8+ T cells by sustained high levels of IL-15 (650–800 pg/ml in the circulation). To test this possibility, we next examined the expression level of the activation markers CD44 and CD69 (Fig. 2⇓A) on the NK1.1+ T cells. Approximately 86% of CD8+NK1.1+ T cells from IL-15 Tg mice were CD44+CD69−, indicating a memory phenotype, not an activated phenotype. This frequency was similar to that of the cells from wild-type mice. We also examined the expression of those activation markers on CD4+NK1.1+ T (mostly iNKT) cells from both IL-15 Tg and wild-type mice (Fig. 2⇓B). As reported previously, most of the CD4+NK1.1+ T cells had the phenotype of activated T cells, CD69+CD44+, and there was no significant difference between the cells from IL-15 Tg and wild-type mice. We further examined the effect of chronic in vivo exposure of iNKT cells to a high level of IL-15 on the TCR repertoire. As shown in Fig. 3⇓A, iNKT cells in wild-type mice express a very limited TCR V β-chain repertoire. We could not see any significant changes in the TCR Vβ repertoire in either CD4+ or double negative populations of iNKT cells from IL-15 Tg mice, suggesting that the high level of IL-15 does not affect the number, activation status, or TCR repertoire of iNKT cells in vivo. CD8+NK1.1+ T cells of IL-15 Tg mice are not simply activated conventional CD8+ T cells. A, Spleen cells of IL-15 Tg mice and wild-type littermate mice were stained with fluorescent-labeled mAbs against NK1.1, CD8α, CD44, and CD69 and then the cells were analyzed by flow cytometry. The dot plots of CD44 vs CD69 in the right column represent the gated CD8α+NK1.1+ population shown in the left column. B, Spleen cells of IL-15 Tg mice and wild-type littermate mice were stained with fluorescent-labeled mAbs against NK1.1, CD4, CD44, and CD69 and then the cells were analyzed by flow cytometry. The dot plots of CD44 vs CD69 in the right column represent the gated CD4+NK1.1+ population shown in the left column. C, Spleen cells or liver lymphocytes of IL-15 Tg mice and wild-type littermate mice were stained with fluorescent-labeled mAbs against CD3, NK1.1, CD8α, and CD8β and then the cells were analyzed by flow cytometry. The dot plots of CD8α vs CD8β in the columns on the right represent the gated CD3+NK1.1+ population shown in the columns on the left. The TCR repertoire of NKT cells in IL-15 Tg mice. Spleen cells of IL-15 Tg mice and wild-type littermate mice were stained with fluorescent-labeled α-GalCer-loaded CD1d-tetramer, mAbs against CD3, NK1.1, CD4, CD8α, and CD8β, and either pan-Vβ, Vβ2, Vβ3, Vβ4, Vβ5.1 and 5.2, Vβ6, Vβ7, Vβ8.1 and 8.2, Vβ8.3, Vβ9, Vβ10, Vβ11, Vβ12, Vβ13, Vβ14, Vβ17, Vα2, Vα3.2, Vα8, or Vα11.11, and then the cells were analyzed by flow cytometry. A, The gated CD3+ α-GalCer-loaded CD1d-tetramer+ cell population was examined for the expression of different TCR chains, and the proportions within the gated population were shown. B, The gated CD3+NK1.1+CD8α+CD8β− and CD3+NK1.1+CD8α+CD8β+ cell populations of IL-15Tg mice were compared for the expression of different TCR chains, and the proportions within the gated population were shown. C, The gated CD3+NK1.1+CD8α+CD8β− cell populations of wild-type and IL-15 Tg mice were compared for the expression of different TCR chains, and the proportions within the gated population were shown. D, The gated CD3+NK1.1+CD8α+CD8β+ cell populations of wild-type and IL-15 Tg mice were compared for the expression of different TCR chains, and the proportions within the gated population were shown. We further examined the expression of each chain of the CD8 molecule, CD8α and CD8β (Fig. 2⇑C). Approximately half of the CD8+NK1.1+ T cells did not express CD8 β-chains, which are critical for CD8 molecules to function as coreceptors. Although the frequency of CD8+NK1.1+ cells in wild-type mice was very low, the proportion of CD8αα and CD8αβ was approximately half and half among the CD8+NK1.1+ T cells in spleens, and 70–80% of CD8+NK1.1+ T cells were CD8αα in the livers of both wild-type and IL-15 Tg mice. These data suggest that the chronic high levels of IL-15 increase the abundance of CD8+NK1.1+ T cells in vivo and that these more abundant CD8+NK1.1+ T cells are not all simply activated conventional CD8αβ T cells, nor are they iNKT cells that have up-regulated CD8. We also observed that spleen cells cultured with high levels of IL-15 (35 or 70 nM) expressed CD69 on CD8+ T cells (data not shown), indicating that IL-15 activation is marked by the up-regulation of CD69 and supporting the hypothesis that the more abundant CD8+NK1.1+ T cells, which are CD69−, in the IL-15 Tg mice are not activated conventional CD8+ T cells. We also examined the TCR repertoire of CD8ααNK1.1+ T cells and CD8αβNK1.1+ T cells in both wild-type and IL-15 Tg mice by using a panel of mAbs specific for different Vβ or V α-chains of the TCR. Comparison of the TCR repertoire of CD8ααNK1.1+ T cells and CD8αβNK1.1+ T cells of IL-15 Tg mice showed that there is a significant difference in the frequency of the cells expressing Vβ4 (p < 0.009), Vβ9 (p < 0.05), Vβ12 (p < 0.02), Vβ13 (p < 0.02), and Vα2 (p < 0.004) in each cell population. To take into account in the statistical analysis the fact that we examined multiple Vβ and Vα types, we compared the overall difference between the two cell populations for all of the Vβ and Vα types tested by using Fisher’s method for combining p values, which showed that the overall TCR repertoires of these two cell populations were significantly different (p = 0.0015). This result indicated that CD8ααNK1.1+ T cells and CD8αβNK1.1+ T cells are distinct cell populations (Fig. 3⇑B). Although the frequency of the cells expressing Vβ2 (p < 0.03) and Vβ13 (p < 0.02) were significantly different between CD8ααNK1.1+ T cells from wild-type mice and IL-15 Tg mice, the overall TCR repertoires of these cells in the two strains of mice were not significantly different (p = 0.16 by Fisher’s method for combining p values) (Fig. 3⇑C). This result suggested that the large population of CD8ααNK1.1+ T cells from IL-15 Tg mice can be used to study the equivalent but relatively rare population of CD8ααNK1.1+ T cells existing in wild-type mice. It is also worth noting that CD8αβNK1.1+ T cells from wild-type and IL-15 Tg mice similarly did not show a significant difference in the overall TCR repertoire (p = 0.26 by Fisher’s method for combining p values) (Fig. 3⇑D). Because it has been suggested that IL-15 plays a critical role in the development of CD8+ IELs (5, 14) or the acquisition of CD8αα on IELs (15), we next asked whether the CD8ααNK1.1+ T cells in the spleens of IL-15 Tg mice have a surface phenotype similar to that of IELs. The expression of CD2 (16), CD28 (17), and CD90 (Thy1.2) (18), which have been reported to be down-regulated on IELs, and that of CD103 (αEβ7 integrin), a homing receptor for the mucosal epithelium, and CD127 (IL-7Rα) were examined (Fig. 4⇓, A and B). The proportion of CD28+ cells was significantly higher among CD8ααNK1.1+ T cells in IL-15 Tg mice than it was among CD8αα and CD8αβ TCRαβ IELs (p < 0.05; Fig. 4⇓B), although it was lower than in CD8αβNK1.1+ T cells (p < 0.04) from both wild-type and IL-15 Tg mice (Fig. 4⇓A). In contrast to CD28 expression, most CD8ααNK1.1+ T cells were positive for CD2, unlike IELs (p < 0.05, Fig. 4⇓B). For CD90 expression, the frequency of CD90+ cells among CD8ααNK1.1+ T cells was also higher than that among TCRαβ IELs (p < 0.05; Fig. 4⇓B), although it was significantly lower than that of CD8αβNK1.1+ T cells (p < 0.03) from both IL-15 Tg and wild-type mice (Fig. 4⇓A). Interestingly, the frequency of CD90+ cells among CD8αβ TCRαβ IELs (78.6 ± 2.2%) was significantly higher than that among CD8αα TCRαβ IELs (22.4 ± 2.6%, p < 0.05). The expression of CD127 was down-regulated in all NK1.1+ T cells from IL-15 Tg mice compared with the cells from wild-type mice (Fig. 4⇓A), presumably due to the continued exposure of these cells to circulating IL-15. However, the proportion of CD127+ cells among CD8ααNK1.1+ T cells was significantly higher than that among CD8αα TCRαβ IELs (p < 0.05). Among CD103+ cells, consistent with a previous report (19), >80% of CD8NK1.1− T cells expressed CD103 (data not shown). The proportion of CD103+ cells among CD8αβNK1.1+ T cells was significantly higher than that among CD8ααNK1.1+ T cells (p < 0.04) but far lower than that in CD8αα and CD8αβ TCRαβ IELs, where almost 100% of them express CD103 (Fig. 4⇓, A and B). The differences between these markers on CD8ααNK1.1+ T cells and those from CD8αα IELs, especially for CD2, CD28, CD90, and CD103, suggest that the CD8ααNK1.1+ T cells in IL-15 Tg mice are not increased IELs circulating in the periphery and that they are a heterogeneous cell population. Surface marker expression on NK1.1+ T cells. Spleen cells of IL-15 Tg (IL15Tg) and wild-type (WT) mice and IELs of wild-type mice were stained with fluorescent-labeled mAbs against TCRβ, NK1.1, CD4, CD8α, and CD8β and CD2, CD28, CD90, CD103, or CD127 and then the cells were analyzed by flow cytometry. A, In the analysis, the gated TCRβ+NK1.1+CD8α+CD8β− (CD8αα), TCRβ+NK1.1+CD8α+CD8β+ (CD8αβ) cells were examined for an expression of CD2, CD28, CD90, CD103, or CD127. The frequency of cells expressing each surface marker in each subset of NK1.1+ T cells was plotted. B, In the analysis, the gated TCRβ+NK1.1+ population from spleens of IL15Tg (IL15TgNK1T) or gated TCRβ+ population from IEL of WT mice (WT IEL TCR+ were further gated as CD8α+CD8β− (CD8αα) and CD8α+CD8β+ (CD8αβ) to examine for the expression of CD2, CD28, CD90, CD103, or CD127. The frequency of cells expressing each surface marker in each subset of NK1.1+ T cells was plotted. To further characterize the CD8ααNK1.1+ T cells that are abundant in the IL-15 Tg mice, we decided to use an ex vivo culture system in which CD8+NK1.1+ cells are expanded ex vivo from bone marrow cells by using IL-15. After a 2-wk culture of bone marrow cells from wild-type B6 mice with 35–70 nM IL-15, the frequency of NK1.1+ T cells was increased ∼10-fold (Fig. 5⇓). None of the ex vivo expanded NK1.1+ T cells were CD4+ and approximately half of them were CD8+. The frequency of CD8αα cells among the CD8+NK1.1+ T cells was similar to that observed in spleens of IL-15 Tg mice. By using this ex vivo culture system, we next asked whether the precursors of the CD8ααNK1.1+ T cells are CD8αβ cells or CD8αα cells (Fig. 6⇓, A and B). Either CD8α+ or CD8β+ cells were depleted from bone marrow cells of wild-type B6 mice before the ex vivo expansion with IL-15. CD8ααNK1.1+ T cells were successfully expanded ex vivo from CD8β-depleted bone marrow cells, whereas CD8αβNK1.1+ T cells were not (Fig. 6⇓A). In contrast, the CD8+NK1.1+ T cells failed to expand from CD8α-depleted bone marrow cells (Fig. 6⇓B). These results suggested that the precursors of CD8ααNK1.1+ T cells were CD8α+ but negative for CD8β. In contrast, CD8α+CD8β+ T cells arose from a CD8β+ precursor population. This is consistent with the previous conclusion that the CD8ααNK1.1+ T cells were not simply activated conventional CD8+ T cells. CD8+NK1.1+ T cells can be expanded ex vivo with IL-15 from bone marrow cells of wild-type C57BL/6 mice. Bone marrow cells of wild-type C57BL/6 mice were cultured with 70 nM IL-15 for 2 wk. The cells before and after a 2-wk culture were stained with fluorescent-labeled mAbs against NK1.1, CD8α, CD8β, and CD3 or pan-TCR Vβ and then the cells were analyzed by flow cytometry. The dot plots of CD8α vs CD8β and CD8α vs CD4 represent the gated CD3+NK1.1+ population. CD8αα cells but not CD8αβ cells are precursors of BM-derived CD8ααNK1.1+ T cells. A and B, bone marrow cells of wild-type C57BL/6 mice were cultured with 70 nM IL-15 for 2 wk. The cells were stained with fluorescent-labeled mAbs against CD3, NK1.1, CD8α, and CD8β and then the cells were analyzed by flow cytometry. The dot plots of CD8α vs CD8β represent the gated CD3+NK1.1+ population. A, In one culture, CD8β+ cells were depleted from the bone marrow cells by using magnetic beads before the culture. B, In one culture, CD8α+ cells were depleted from the bone marrow cells by using magnetic beads before the culture. C, Bone marrow cells of OT-1 Tg and wild-type C57BL/6 mice were cultured with 70 nM IL-15 for 2 wk. The cells were stained with SIINFEKL peptide-loaded Kb pentamer and fluorescent-labeled mAbs against NK1.1, CD8α, and CD8β, and then the cells were analyzed by flow cytometry. The dot plots of SIINFEKL peptide-loaded Kb pentamer vs CD8β represent the gated CD8α+NK1.1+ population. The hypothesis that CD8ααNK1.1+ T cells were not simply activated conventional CD8+ T cells was further examined by using ex vivo cultured bone marrow cells of OT-I Tg mice expressing a Tg TCR specific for the OVA epitope SIINFEKL presented by H-2 Kb. Because the OT-1 Tg mice used for the experiment were not deficient for RAG genes, the mice have some CD8+ T cells that do not express the OT-1 TCR as well as CD8+ T cells expressing the OT-1 TCR. Therefore, we could test whether CD8ααNK1.1+ T cells can be derived ex vivo with IL-15 from OT-1 TCR-expressing conventional CD8+ T cells as well as from the rest of the cells in the same culture. After 2 wk, the cells were stained with a SIINFEKL peptide-loaded Kb pentamer detecting T cells with the Tg TCR along with anti-NK1.1, anti-CD8α, and anti-CD8β. As shown in Fig. 6⇑C, CD8ααNK1.1+ T cells were expanded from bone marrow cells of OT-1 Tg mice, although the proportion of the cells among CD8+NK1.1+ T cells was lower compared with that of the cells expanded from wild-type bone marrow cells. However, none of CD8ααNK1.1+ T cells was stained with SIINFEKL peptide-loaded Kb pentamer, supporting the conclusion that CD8ααNK1.1+ T cells were not simply activated conventional CD8+ T cells. We next investigated the restriction element for the development or expansion of CD8ααNK1.1+ T cells by using bone marrow cells from β2-microglobulin, CD1d, or I-A gene knockout (KO) mice. As shown in Fig. 7⇓A, CD8ααNK1.1+ T cells failed to arise from β2 microglobulin KO bone marrow cells but did derive from CD1d or I-A KO bone marrow cells. Because the results shown in Fig. 7⇓A suggested a role of MHC class I as a restriction element for CD8ααNK1.1+ T cells, we further examined the role of MHC class I by using bone marrow cells of DbKb double KO and TAP-1 KO mice (Fig. 7⇓B). Compared with the cells derived from wild-type bone marrow cells, the frequency of CD8ααNK1.1+ T cells in the culture was approximately only 1/3 with TAP-1 KO and 1/7 with DbKb KO cells. No CD4+NK1.1+T cells were observed in the culture (Fig. 7⇓B). Therefore, the residual cells were double negative for CD4 and CD8. The results suggested that although CD8ααNK1.1+ T cells seem to be unconventional CD8+ T cells, a majority of them are restricted by MHC class I molecules and recognize peptide Ags. β2-Microglobulin but not CD1d or MHC class II is necessary for the development of precursors of BM-derived CD8ααNK1.1+ T cells. Bone marrow cells of wild-type, CD1d KO, β2-microglobulin KO, and I-A KO C57BL/6 mice (A) or wild-type, TAP-1 KO, and DbKb KO mice (B) were cultured with 70 nM IL-15 for 2 wk. The cells were stained with either set of fluorescent-labeled mAbs against TCRβ, NK1.1, CD8α, and CD8β or TCRβ, NK1.1, CD8α, and CD4, and then the cells were analyzed by flow cytometry. The dot plots of CD8α vs CD8β and CD8α vs CD4 represent the gated TCRβ+ NK1.1+ population. We also examined the expression of NK cell markers on both CD8αβNK1.1+ T cells and CD8ααNK1.1+ T cells to see whether there is any difference in the expression pattern of NK markers between the two CD8α+NK1.1+ T cell populations (Fig. 8⇓). There was little difference in the frequency of the cells expressing most of the NK cell markers within each CD8α+NK1.1+ T cell population. However, CD8ααNK1.1+ T cells had a higher frequency of DX5+, 2B4+, or Ly49G+ cells, and CD8αβNK1.1 T cells had approximately a double frequency of Ly49D+ cells. Although it is not clear what the functional relevance is of these slight differences in the frequency of the cells expressing different NK cell markers, it is consistent with the notion that CD8ααNK1.1+ T cells comprise a cell subset different from CD8αβNK1.1+ T cells. Expression of NK receptors on CD8+NK1.1+ T cells. Bone marrow cells of wild-type C57BL/6 mice were cultured with 70 nM IL-15 for 2 wk. The cells were stained with fluorescent-labeled mAbs against NK1.1, CD8α, CD8β, and different NK receptors and then the cells were analyzed by flow cytometry. The dot plots of CD8β vs NK receptors represent the gated CD8α+NK1.1+ population. We next examined the cytolytic function and the ability to produce cytokines of CD8+NK1.1+ T cells. The lytic activity of the CD8+NK1.1+ T cells was measured by the staining of surface CD107a and CD107b as a measure of degranulation (11). 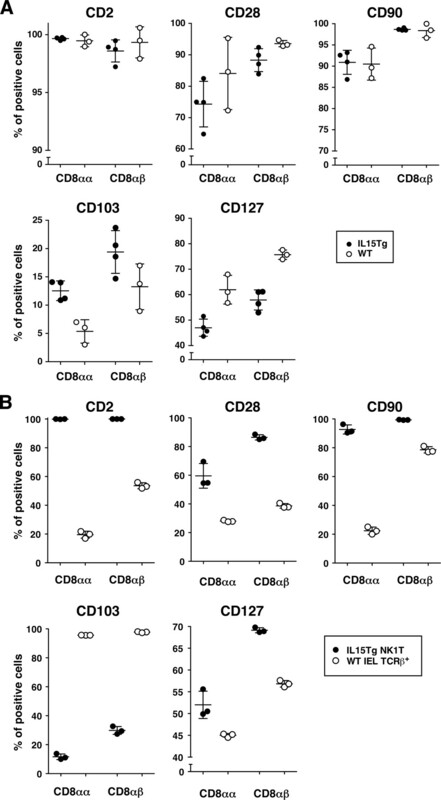 Bone marrow-derived CD8+NK1.1+ T cells were stimulated with immobilized anti-CD3 and anti-CD28, and stained for CD107a and CD107b on the cell surface (Fig. 9⇓A). Upon TCR stimulation, both CD8ααNK1.1+ T cells and CD8αβNK1.1+ T cells became positive for CD107, although the proportion of CD107+ cells was lower than that of conventional CD8+NK1.1− T cells. 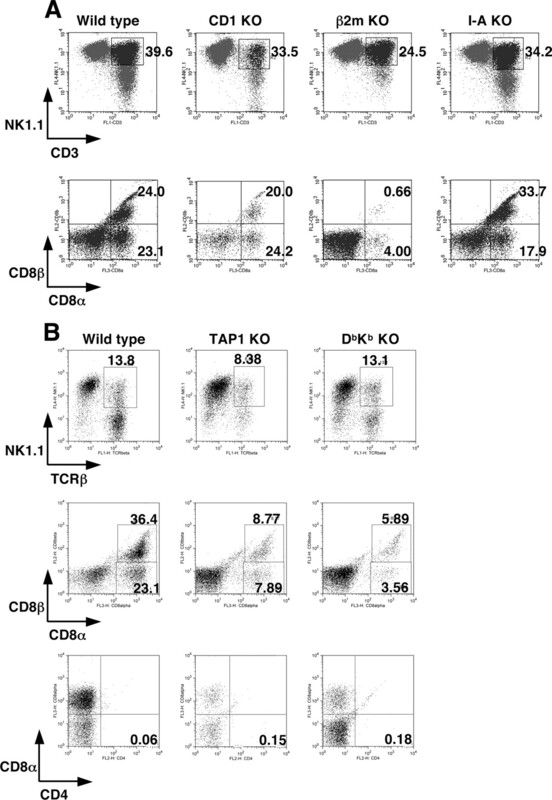 This result indicates that both subsets of CD8+NK1.1+ T cells have the ability to degranulate. Both CD8ααNK1.1+ T cells and CD8αβNK1.1+ T cells stained positive for intracellular perforin, although the expression level was not as high as that among NK1.1+TCR− cells but higher than that among NK1.1−CD8+ T cells (Fig. 9⇓B). Thus, the cells have a cytolytic function. CD8+NK1.1+ T cells express CD107 upon TCR engagement. Bone marrow cells of wild-type C57BL/6 mice were cultured with 70 nM IL-15 for 2 wk. A, The cells were stimulated with immobilized anti-CD3 and CD28 for 5 h and then stained with fluorescent-labeled mAbs against NK1.1, CD8α, CD8β, and CD107 and then the cells were analyzed by flow cytometry. Each histogram represents an indicated gated cell population. B. The cells were stained with fluorescent-labeled mAbs against NK1.1, CD8α, D8β, TCRβ, and intracellular perforin and then the cells were analyzed by flow cytometry. Each histogram represents an indicated gated cell population. The production of IFN-γ, IL-4, IL-13, and IL-10 was also examined by measuring the cytokine level in the culture supernatant of anti-CD3- and anti-CD28-stimulated bone marrow-derived CD8+NK1.1+ T cells (Table I⇓). Both CD8αα and CD8αβNK1.1+ T cells produced an extremely large amount of IFN-γ, but the levels of IL-4 and IL-10 were under the detection limit. A very low level of IL-13 was also produced by both subsets of CD8+NK1.1+ T cells. There was no significant difference in the cytokine profile between CD8ααNK1.1+ and CD8αβNK1.1+ T cells. These results suggested that CD8ααNKT1.1+ T cells as well as CD8αβNK1.1+ T cells have a very strong Tc1 type phenotype similar to that of conventional CD8+ T cells. Overall, although CD8ααNK1.1+ T cells, which are significantly more abundant in IL-15 Tg mice, are not just activated conventional CD8+ T cells, their function seems to be very similar to that of conventional CD8+ T cells. In this study we report that IL-15 increases the abundance not only of conventional CD8αβ T cells but also of a less common population of T cells that express NK1.1 and CD8. These NK1.1+CD8+ T cells consist of at least two different subsets, CD8ααNK1.1+ T cells and CD8αβNK1.1+ T cells. Although we could not exclude the possibility that the CD8αβNK1.1+ T cells were activated conventional CD8+ T cells that had acquired NK1.1 as an activation marker (12, 13), the CD8ααNK1.1+ T cells seemed to be different from activated conventional CD8αβ T cells and represent a different novel CD8+ T cell subset because of the following findings: 1) the CD8αα cells were not derived ex vivo by IL-15 from CD8α− cells but were derived from CD8β− bone marrow cells; 2) the cells from IL-15 Tg mice expressed a memory T cell surface marker profile (CD69−CD44+) and thus were not just expressing NK1.1 as an activation marker; 3) the CD8ααNK1.1+ T cells had different TCR Vβ usage from those of CD8αβNK1.1+ T cells from the same IL-15 Tg mice; 4) the CD8ααNK1.1+ T cells and the CD8αβNK1.1+ T cells express different NK receptors; and 5) in TCR Tg mice the CD8ααNK1.1+ T cells do not arise from the TCR Tg conventional T cell population. These results also suggest that CD8ααNK1.1+ T cells are not a fraction of activated conventional CD8+ T cells. However, interestingly enough, the CD8αα and the CD8αβNK1.1+ T cells seemed to share their functions as they both showed a Th1 skewed cytokine profile and lytic activity upon CD3 stimulation, and both populations are dependent on conventional class I MHC molecules and the TAP transporter of peptides. In characterizing the CD8+NK1.1+ T cell population in the IL-15 Tg mice, we asked whether these was a subset of iNKT cells. We also attempted to address how IL-15 contributes to the maintenance of iNKT cells. It has been shown previously that IL-15 is necessary for the maintenance of peripheral iNKT cells (7). In that report, it was shown by adoptively transferring iNKT cells into various gene-manipulated recipients that competition for IL-15 between NK and NKT cells may be a limiting factor for iNKT cell proliferation in the periphery. We hypothesized that if this were the case, the increase observed in NK1.1+T cells in IL-15 Tg mice may be partly contributed to by the increase in IL-15-dependent proliferation of iNKT cells. However, using CD1d-tetramers to identify iNKT cells, we did not see any change in their numbers or surface phenotype compared with wild-type mice. In particular, the iNKT cells remained CD4+ or CD4CD8 double negative and did not up-regulate CD8 expression in IL-15 Tg mice. Therefore, the CD8+NK1.1+ T cell is not an iNKT cell. The fact that the excess of IL-15 did not increase the number of iNKT cells in vivo may suggest that there are other factors that restrict the population size of iNKT cells. This factor might be a cytokine that shares major receptor components with IL-15, such as IL-2. Recently it was reported that IL-2 acts as both mitogen and nutrient, whereas IL-15 acts only as a mitogen for T cells (20). In a recent publication it was demonstrated, however, that this may be a property only seen with soluble IL-15 and that membrane-associated IL-15 could function as a full growth factor (nutrient and growth factors) (21). It may be possible that IL-2 is another factor that determines the population size of iNKT cells, although IL-2 has been reported to be unnecessary for the development of NK1.1+ T cells in the thymus (22). Another γ-chain cytokine, IL-21, may also be a potential cytokine regulating the population size of iNKT cells, as it has been shown to enhance their proliferation (23). IL-15 has also been connected to the development of IEL. CD8αα TCRαβ IELs have been shown to be dependent on IL-15 (5, 14, 24). IL-15 is also implicated as playing a critical role in inducing CD8αα and down-regulating CD5 on intrathymically developed precursors of IEL (15). Further, it has been reported that IEL can migrate to the periphery (25). Therefore, we asked whether peripheral CD8ααNK1.1+ T cells in IL-15 Tg were immigrant IELs by examining their surface marker expression. The indicative surface markers CD2, CD28, and CD90, which have been reported to be down-regulated on IELs (16, 17, 18), were highly expressed in CD8ααNK1.1+ T cells with the exception of CD28+, which was expressed at a significantly lower level among CD8ααNK1.1+ T cells than in other NK1.1+ T cell subsets, although it was still significantly higher than the level in CD8αα and CD8αβ TCRαβ IELs. Although the percentage of CD103+ cells among CD8ααNK1.1+ T cells was significantly higher than that among CD8αβNK1.1+ T cells, it was still significantly lower than that in CD8αα and CD8αβ TCRαβ IELs. Taken together with an expression pattern of activation markers, CD44 and CD69, on CD8ααNK1.1+ T cells in IL-15 Tg mice distinct from that of IELs (CD69+CD44+) (26), these results suggest that CD8ααNK1.1+ T cells in IL-15 Tg mice are heterogeneous and that the majority of them are not TCRαβCD8αα IELs, although some may have potential to home to mucosal epithelium. These results are also consistent with the result that CD8ααNK1.1+ T cells grown with IL-15 from bone marrow cells are a heterogeneous cell population in which the majority of them are MHC class I restricted, although some are class I MHC independent, similar to TCRαβCD8αα IELs (27). The expression of surface markers changes in different milieu, conditions, or differentiations. CD127 (IL-7Rα) has been reported to be transiently down-regulated when T cells are signaled by IL-7 through CD127 (28). In contrast, the surface expression of CD28 is lost in a certain type of memory CD8+ T cells at the stage of terminal differentiation (29, 30). Similarly, CD103, which is known to be stably expressed on IELs has been suggested to be induced on CD8+ T cells by TGF-β1 (31). The loss of CD90+ on CD8αα TCRαβ IELs is also considered to be a sign of the terminal differentiation of the precursors from the thymus in the intraepithelial compartment (15). In contrast to those markers mentioned, CD2 is not known to change its expression once it is acquired. Therefore, significant differences in the frequency of the cells expressing all of the markers, CD2, CD28, CD90, and CD103, between CD8ααNK1.1+T cells and CD8αα TCRαβ IELs strongly suggested that these two cells are distinct subsets of T cells. By the ex vivo bone marrow cell culture with IL-15, we showed that most CD8ααNK1.1+ T cells are β2-microglobulin dependent. The class Ib MHC molecule TL (thymic leukemia) Ag, which requires β2-microglobulin, has been implicated in the development of IELs (32, 33), although its role in the periphery seems to be unclear (34). However, the C57BL/6 mice used in this study have been reported to be negative for TL in most tissues, including thymus (35). Together with the fact that at least a majority of CD8ααNK1.1+ T cells are dependent on TAP-1 and DbKb, which are not required for TL, a majority of the CD8ααNK1.1+ T cells found in the IL-15 Tg mice cannot be TL dependent. It has been reported that efficient presentation of IL-15 in vivo increased CD44+CD69− memory CD8+ T cells (21, 36, 37). Consistent with those reports, the frequency of CD44+CD69− cells among conventional NK1.1−CD8+ cells was significantly higher and the frequency of naive CD44−CD69− cells was lower in IL-15 Tg mice than in wild-type mice. In contrast, most CD8+NK1.1+ T cells, including CD8ααNK1.1+ T cells, were CD44+CD69− in both IL-15 Tg and wild-type mice, and the ratio between CD44+CD69− and CD44−CD69− fractions did not change. These results suggested that, at least in the periphery, most of the CD8+NK1.1+ T cells acquire CD44 with IL-15 signaling as soon as they get to the periphery, possibly without going through conventional activation status (CD44+CD69+). Interestingly, this is in contrast with another T cell population, iNKT cells, that constitutively express CD44 and mostly NK1.1 in the periphery. In the case of iNKT cells, the cells recognize endogenous Ags presented by CD1d, which is widely expressed on different cell types and is believed to maintain the iNKT cells in an activated state in which they chronically express CD44 and CD69 on the cell surface (38, 39). In fact, recently it was reported that IL-15 KO mice lack “memory phenotype” but not “naive phenotype” CD8+ T cells, whereas Tec kinase (ITK) KO mice lack “naive phenotype” CD8+ T cells although they have normal “memory phenotype” CD8+ T cells (40, 41). This report suggested the possibility that “memory phenotype” and “naive phenotype” CD8+ T cells are two independent subsets maintained by different factors. Because the authors did not examine the expression of CD8 β-chain on CD8+ T cells in the report, it is possible that the CD8ααNK1.1+ T cell is a second subset of CD8+ T cells with “memory phenotype” that is supported by IL-15 and distinct from CD8+ T cells with “naive phenotype.” This hypothesis is also consistent with the observation that there are almost no NK1.1+ T cells in IL-15 or IL-15Rα gene-deficient mice (5). One of the differences between CD8ααNK1.1+ T cells and CD8αβNK1.1+ T cells was the expression of Ly49G2. This inhibitory NK receptor was expressed at a higher frequency among CD8ααNK1.1+ T cells than among CD8αβNK1.1+ T cells. Peacock and Welsh have reported that Ly49G2+CD8+ T cells represent a cell lineage distinct from bona fide memory T cells in lymphocytic choriomeningitis virus (LCMV) infection (42). They showed that although both Ly49G2+ and Ly49G2− LCMV-specific CD8+ T cells proliferated and produced IFN-γ upon Ag priming and restimulation, the Ly49G2+ subset expanded from the pool of Ly49G2+ cells among the naive cells, not from the Ly49G2− subset. Although it was not examined in their study whether or not the Ly49G2+ subset expresses CD8β, the characteristics of the Ly49G2+ subsets are similar to the characteristics of CD8ααNK1.1+ T cells, including IFN-γ production, the ability to degranulate upon stimulation, and the high frequency of CD44+ cells in naive mice. However, IL-15 failed to expand SIINFEKL-specific CD8ααNK1.1+ T cells from OT-I TCR transgenic mice although it could expand SIINFEKL-specific CD8αβNK1.1+ T cells. Together with the results showing the reduced frequency of CD8ααNK1.1+ T cells in the culture with IL-15 expanded from MHC class I KO and TAP1 KO bone marrow cells, which is consistent with a previous report of CD8+NK1.1+ T cells (43), it is suggested that the majority of CD8ααNK1.1+ T cells recognize a set of peptide Ags presented by MHC class I molecules different from that of CD8αβ T cells. This idea is also supported by the report showing that CD8αα T cells can go through an intrathymic positive selection restricted by an agonistic peptide presented by MHC class I (44). Therefore, although more precise study is require for understanding the identity of the two similar CD8+ T cell subsets, Ly49G2+CD8+ T cells and CD8ααNK1.1+ T cells, nevertheless CD8ααNK1.1+ T cells represent a novel lineage of highly active CD8+ T cells made apparent by the high levels of IL-15 in IL-15 Tg mice. Another difference between the two subsets of CD8+NK1.1+ T cells was the frequency of cells expressing Ly49D, which is an NK-activating receptor and is reported to be expressed on activated T cells. The frequency was higher on CD8αβNK1.1+ T cells compared with CD8ααNK1.1+ T cells. This observation is consistent with the idea that CD8ααNK1.1+ T cells are not simply activated T cells. In contrast, both subsets of CD8+NK1.1+ T cells express similar levels of another NK activating receptor, NKG2D, which recognizes different receptors from Ly49D on target cells. These observations also suggest that these two types of CD8+NK1.1+ T cells may recognize different types of cells as their targets. In summary, we show that CD8ααNK1.1+ T cells, which comprise a unique T cell subset, have significant differences from conventional CD8 T cells and CD8αβNK1.1+ T cells and are present at a high proportion in IL-15 Tg mice. Although they seem to be a heterogeneous cell population, the majority of them are TAP-1 and DbKb dependent and have characteristics different from those of CD8αα IELs. Together with ex vivo culture of bone marrow cells with IL-15, IL-15 Tg mice provide a unique opportunity to study what is otherwise a very small subset of T cells. We thank Dr. David Venzon for the discussion and help for statistical analysis of data, Drs. Mitchel Kronenberg and Stephane Sidobre for providing CD1d-tetramers, and Dr. Albert Bendelac for providing CD1d KO mice. ↵1 This work was supported in part by the Intramural Research Program of the National Institutes of Health, National Cancer Institute, Center for Cancer Research. ↵3 Abbreviations used in this paper: iNKT cell, NKT cell with invariant TCR α-chain Vα14Jα18 segment; α-GalCer, α-galactosylceramide; KO, knockout; Tg, transgenic; TL, thymic leukemia. Oh, S., L. P. Perera, D. S. Burke, T. A. Waldmann, J. A. Berzofsky. 2004. IL-15/IL-15R α-mediated avidity maturation of memory CD8+ T cells. Proc. Natl. Acad. Sci. USA 101: 15154-15159. Matsuda, J. L., L. Gapin, S. Sidobre, W. C. Kieper, J. T. Tan, R. Ceredig, C. D. Surh, M. Kronenberg. 2002. Homeostasis of Vα14i NKT cells. Nat. Immunol. 3: 966-974. Ranson, T., C. A. Vosshenrich, E. Corcuff, O. Richard, V. Laloux, A. Lehuen, J. P. Di Santo. 2003. IL-15 availability conditions homeostasis of peripheral natural killer T cells. Proc. Natl. Acad. Sci. USA 100: 2663-2668. Marks-Konczalik, J., S. Dubois, J. M. Losi, H. Sabzevari, N. Yamada, L. Feigenbaum, T. A. Waldmann, Y. Tagaya. 2000. IL-2-induced activation-induced cell death is inhibited in IL-15 transgenic mice. Proc. Natl. Acad. Sci. USA 97: 11445-11450. Fehniger, T. A., K. Suzuki, A. Ponnappan, J. B. VanDeusen, M. A. Cooper, S. M. Florea, A. G. Freud, M. L. Robinson, J. Durbin, M. A. Caligiuri. 2001. Fatal leukemia in interleukin 15 transgenic mice follows early expansions in natural killer and memory phenotype CD8+ T cells. J. Exp. Med. 193: 219-231. Zhu, Q., C. W. Thomson, K. L. Rosenthal, M. R. McDermott, S. M. Collins, J. Gauldie. 2008. Immunization with adenovirus at the large intestinal mucosa as an effective vaccination strategy against sexually transmitted viral infection. Mucos. Immunol. 1: 78-88. Lambolez, F., M. Kronenberg, H. Cheroutre. 2007. Thymic differentiation of TCRαβ+CD8αα+ IELs. Immunol. Rev. 215: 178-188. Van Houten, N., P. F. Mixter, J. Wolfe, R. C. Budd. 1993. CD2 expression on murine intestinal intraepithelial lymphocytes is bimodal and defines proliferative capacity. Int. Immunol. 5: 665-672. Ohteki, T., H. R. MacDonald. 1993. Expression of the CD28 costimulatory molecule on subsets of murine intestinal intraepithelial lymphocytes correlates with lineage and responsiveness. Eur. J. Immunol. 23: 1251-1255. Klein, J. R.. 1986. Ontogeny of the Thy-1−, Lyt-2+ murine intestinal intraepithelial lymphocyte: characterization of a unique population of thymus-independent cytotoxic effector cells in the intestinal mucosa. J. Exp. Med. 164: 309-314. Andrew, D. P., L. S. Rott, P. J. Kilshaw, E. C. Butcher. 1996. Distribution of α4β7 and αEβ7 integrins on thymocytes, intestinal epithelial lymphocytes and peripheral lymphocytes. Eur. J. Immunol. 26: 897-905. Cornish, G. H., L. V. Sinclair, D. V. Cantrell. 2006. Differential regulation of T-cell growth by IL-2 and IL-15. Blood 108: 600-608. Sato, N., H. J. Patel, T. A. Waldmann, Y. Tagaya. 2007. The IL-15/IL-15Rα on cell surfaces enables sustained IL-15 activity and contributes to the long survival of CD8 memory T cells. Proc. Natl. Acad. Sci. USA 104: 588-593. Ohteki, T., S. Ho, H. Suzuki, T. W. Mak, P. S. Ohashi. 1997. Role for IL-15/IL-15 receptor β-chain in natural killer 1.1+ T cell receptor-αβ+ cell development. J. Immunol. 159: 5931-5935. Yu, Q., C. Tang, S. Xun, T. Yajima, K. Takeda, Y. Yoshikai. 2006. MyD88-dependent signaling for IL-15 production plays an important role in maintenance of CD8αα TCRαβ and TCRγδ intestinal intraepithelial lymphocytes. J. Immunol. 176: 6180-6185. Stankovic, S., Y. Zhan, L. C. Harrison. 2007. Homeostatic proliferation of intestinal intraepithelial lymphocytes precedes their migration to extra-intestinal sites. Eur. J. Immunol. 37: 2226-2233. Wang, H. C., Q. Zhou, J. Dragoo, J. R. Klein. 2002. Most murine CD8+ intestinal intraepithelial lymphocytes are partially but not fully activated T cells. J. Immunol. 169: 4717-4722. Gapin, L., H. Cheroutre, M. Kronenberg. 1999. Cutting edge: TCRαβ+ CD8αα+ T cells are found in intestinal intraepithelial lymphocytes of mice that lack classical MHC class I molecules. J. Immunol. 163: 4100-4104. Hadley, G. A., S. T. Bartlett, C. S. Via, E. A. Rostapshova, S. Moainie. 1997. The epithelial cell-specific integrin, CD103 (αE integrin), defines a novel subset of alloreactive CD8+ CTL. J. Immunol. 159: 3748-3756. Tsujimura, K., T. Takahashi, A. Morita, H. Hasegawa-Nishiwaki, S. Iwase, Y. Obata. 1996. Positive selection of γ δ CTL by TL antigen expressed in the thymus. J. Exp. Med. 184: 2175-2184. Sydora, B. C., L. Brossay, A. Hagenbaugh, M. Kronenberg, H. Cheroutre. 1996. TAP-independent selection of CD8+ intestinal intraepithelial lymphocytes. J. Immunol. 156: 4209-4216. Pardigon, N., S. Darche, B. Kelsall, J. R. Bennink, J. W. Yewdell. 2004. The TL MHC class Ib molecule has only marginal effects on the activation, survival, and trafficking of mouse small intestinal intraepithelial lymphocytes. Int. Immunol. 16: 1305-1313. Wu, M., L. van Kaer, S. Itohara, S. Tonegawa. 1991. Highly restricted expression of the thymus leukemia antigens on intestinal epithelial cells. J. Exp. Med. 174: 213-218. Stoklasek, T. A., K. S. Schluns, L. Lefrancois. 2006. Combined IL-15/IL-15Rα immunotherapy maximizes IL-15 activity in vivo. J. Immunol. 177: 6072-6080. Vincent, M. S., J. E. Gumperz, M. B. Brenner. 2003. Understanding the function of CD1-restricted T cells. Nat. Immunol. 4: 517-523. Dubois, S., T. A. Waldmann, J. R. Muller. 2006. ITK and IL-15 support two distinct subsets of CD8+ T cells. Proc. Natl. Acad. Sci. USA 103: 12075-12080. Broussard, C., C. Fleischacker, R. Horai, M. Chetana, A. M. Venegas, L. L. Sharp, S. M. Hedrick, B. J. Fowlkes, P. L. Schwartzberg. 2006. Altered development of CD8+ T cell lineages in mice deficient for the Tec kinases Itk and Rlk. Immunity 25: 93-104. Peacock, C. D., R. M. Welsh. 2004. Origin and fate of lymphocytic choriomeningitis virus-specific CD8+ T cells coexpressing the inhibitory NK cell receptor Ly49G2. J. Immunol. 173: 478-484. Emoto, M., J. Zerrahn, M. Miyamoto, B. Perarnau, S. H. Kaufmann. 2000. Phenotypic characterization of CD8+ NKT cells. Eur. J. Immunol. 30: 2300-2311. Leishman, A. J., L. Gapin, M. Capone, E. Palmer, H. R. MacDonald, M. Kronenberg, H. Cheroutre. 2002. Precursors of functional MHC class I- or class II-restricted CD8αα+ T cells are positively selected in the thymus by agonist self-peptides. Immunity 16: 355-364.